An oil painting & prints of a Loch Ness at sunset in The Highlands of Scotland. 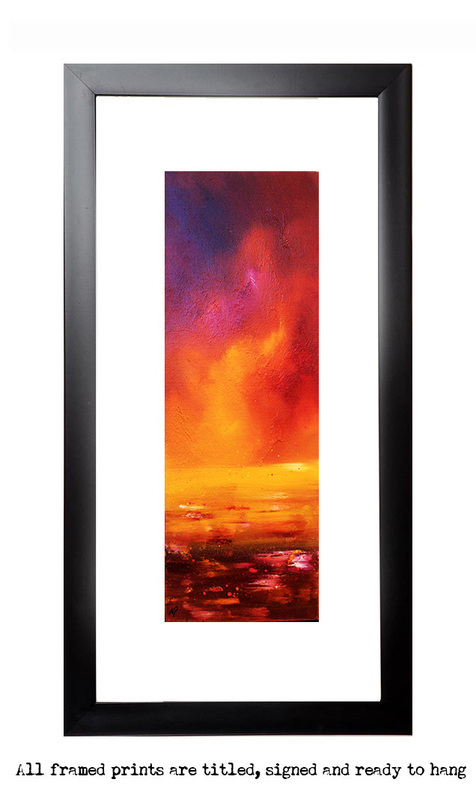 Prints of an original abstract, atmospheric skyscape painting of a summer sunset over Loch Ness, Scotland. A dramatic mix of mediums in very vibrant colours are blended and layered over the canvas to produce a very atmospheric painting depicting the ever changing light and weather conditions of Scotland’s Highland lochs. I love to combine and layer the different types of paint and application of medium, creating a unique style of atmospheric painting full of colour and drama. Loch Ness, Magenta Sunset, Highlands, Scotland. Painting and prints by Scottish contemporary landscape artist A Peutherer.